In addition to being logical and Number Smart, a person might also be Word Smart, People Smart or Picture Smart. Gardner has identified the following intelligences: Verbal/Linguistic, Logical/Mathematical, Visual/Spatial, Bodily/Kinesthetic, Musical, Intrapersonal, Interpersonal and Naturalist. Each intelligence is summarized below. 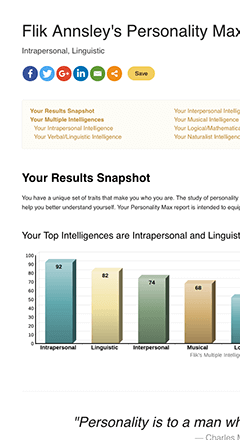 You can take our free Multiple Intelligences Test to discover what your top intelligences are. People with Linguistic intelligence are naturally good with writing or speaking and memorization. People with Logical intelligence are driven by logic and reasoning. People with Visual intelligence are good at remembering images and are aware of surroundings. People with Kinesthetic intelligence love movement, have good motor skills and are aware of their bodies. People with musical intelligence are musically gifted and have a “good ear” for rhythm and composition. People with intrapersonal intelligence are adept at looking inward. People with Interpersonal intelligence are good with people. They thrive at and enjoy social interactions. People with Naturalist intelligence have a sensitivity to and appreciation for nature. They can “see” how nature works. You may also be interested in learning about Learning Styles.